AdWords is a great tool that apartment managers can use to drive qualified leads to their apartment website. Not only do AdWords extensions offer relevant information about your apartment community; they also show based on individual searches on Google. Since AdWords extensions offer value for your apartment marketing budget and provide your readers with helpful information, it is a good idea to use extensions whenever possible. 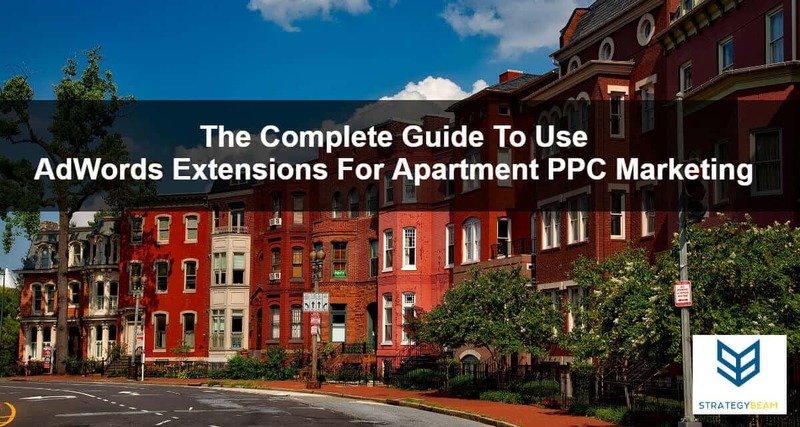 By adding content to your ads, extensions give your apartment PPC ads greater visibility and inform your audience about critical aspects of your apartment complex. This means that you can get the most out of your apartment marketing budget while also pushing your competition down on SERPs. The extension is predicted by Google’s Bid Auction to improve your performance. Your PPC ad’s position and Ad Rank is high enough for your extension to show. Your ad must meet a minimum Ad Rank to factor your extension to show to your audience. However, your apartment community should implement any and all relevant AdWords extensions on your PPC ads to ensure you capture as many qualified clicks as possible. This is one way that your AdWords account can generate more revenue and beat your competition. How Much Do Extensions Cost For Apartment PPC Ads? Extensions themselves do not carry a specific cost to show because you are only charged when someone clicks on the extension, if that extension is clickable on the ad. Now that we have gone through a brief overview of AdWords extensions that you can use in your apartment PPC marketing campaigns let’s take a look at the six most important AdWords extensions that you can use in your next PPC campaign! Sitelink extensions are a great addition to any apartment PPC marketing campaign because they add links to the bottom of your apartment ads that allow people to learn more about specific elements of your apartment community. When someone clicks on a site link extension on your PPC ad they will be directed to a particular page on your website, so you can use this opportunity to highlight different features of your apartment community. Sitelinks will show in some ways on your PPC ads depending on things like the device being used, the position of your ad, and the Ad Rank of your ad. When sitelinks show on desktop computers, they will show 2-6 links, and when they show on mobile devices they can show up to 8 links in a carousel format. Sitelinks will show in a variety of ways depending on device, position, and other factors. When your site link extension appears with one of your ads on a computer, it shows 2 to 6 links, which may look on the same line or fill up to two lines of your ad. This information is a great way to get the most out of your apartment marketing budget and drive more qualified leads to your leasing office! Callout extensions are a powerful tool for your apartment PPC ads because they highlight unique offers and special promotions that you offer. You can stand out from your competition by providing popular or uncommon benefits provided in your apartment community. Instead of using valuable space in your ad copy, you can talk about your 24/7 Maintenance, Local Service, and other features that make your apartment complex unique in callout extensions. Callout extensions show in your apartment PPC ads similarly to how site link extensions appear, but callout extensions will show for ads at the top and bottom of SERPs. Similar to callout extensions, structured snippets can be used to highlight specific aspects of your apartment community. However, unlike callout extensions, structured snippets need to adhere to specific categories/themes, and you do not have as much freedom to choose the types of features that you want to highlight about your apartment complex. Not all of the possible predefined headers are relevant to apartments, but you can choose the ones that matter most for your marketing strategy. Your PPC ads can show up to 2 different structured snippet headers on your ads, but mobile PPC ads will only show one set of snippets. Call extensions are the perfect choice if you are running a mobile-only PPC campaign for your apartment, or you notice that the majority of your website traffic is from mobile devices. Call extensions add a button by your PPC ad so people can click on it to reach your leasing office directly. Since this extension gets your prospective renter directly to your leasing office, you can see a substantial increase in both engagements and tracked conversions. The call extension will add a non-intrusive, yet appealing clickable call button to your PPC ad. You can customize when this feature appears based on the hours that your leasing office is open, so you won’t have to worry about missing calls because the call extension will only be added during hours of operation. Tracking is a breeze with this extension, so you can review how effective your apartment PPC ads are performing in a given period. You also have the option to use a Google-only number that forwards to your leasing office, so you can get an additional layer of tracking for your inbound calls. This is one of the best extensions to use in your apartment marketing campaign because it provides an easy way for mobile users to contact your office directly! Since your apartment complex is in a physical location, you can use location extensions in your AdWords campaigns to inform your customers about where they can find you. This is a great way to make the PPC ad for your apartment look great while also taking up additional real estate on the SERP listing. Once you enable the location extension on your campaign, your address and phone number will appear in a single line near the bottom of your PPC ad. Prospective tenants can also click on the link extension to get further information on your location page. The best part about location extensions is that they can also include your phone number or a call button, so it is easy for prospective renters to reach your leasing office. Reviews are a great form of social proof that shows that your apartment community is a great place to live. You can use review extensions to showcase positive reviews from your current or past tenants. These reviews appear in a single line beneath the description of your PPC ad. A great review extension on your ad can give your audience the extra trust they need to click on your ad. Plus, this information is often a vital piece of the decision-making process when choosing an apartment community. Does your apartment community have different sales or promotions that you want to highlight in your PPC ads? Promotional extensions make your offer stand out from your competition on SERPs so prospective renters can easily spot your great deals and then you can sign more leases. Put AdWords Extensions To Work Today! Now that we covered the different types of AdWords extensions that your apartment community can use, you should start to think about the benefits you offer compared to your competition. Once you identify the benefits you offer you can begin using AdWords extensions in your apartment marketing campaigns. If you are too busy taking care of everything else going on with your apartment complex, you should consider hiring a professional PPC marketer. I can help you set up and optimize your apartment PPC marketing strategy, and together we will drive more qualified traffic to your site and increase signed leases each month!